Unpack your NVR and cameras and place them on a wide, flat surface such as a table or workbench. Make sure you have an easy way to connect to your modem or router for internet access. Connect your NVR to your internet-connected network with a Cat5e cable. Attach a monitor (not included) to the NVR using either a VGA or HDMI cable. Attach the power cord to the back of the NVR and plug into an outlet. 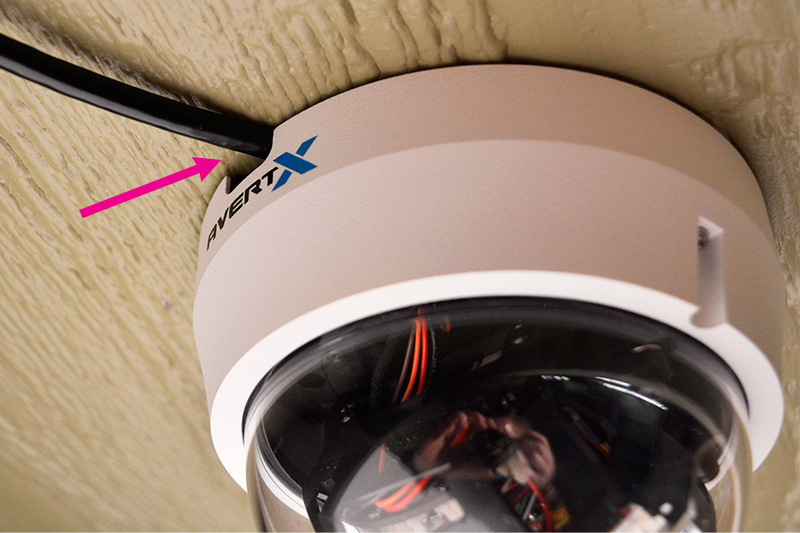 Power the system on, set the time and date and follow the steps to create your AvertX Connect account before connecting cameras to you the NVR. Connect your cameras to the back of the NVR using the included 100’ Cat5e camera cables (the cables do not need to be fully uncoiled for this test). Push firmly until you hear a click. Wait for your cameras to come online; this can take several minutes. If you have purchased microSD cards for in camera backup recording, install the cards in your cameras to ensure they are working correctly. Refer to Quick Start Guide or Manual for setup. Listen to the NVR. The NVR is a powerful device and includes a built in power supply to power the cameras, storage drives, and other internal components. It requires proper cooling and ventilation and has fans that will make noise slightly louder than a desktop computer. Please consider this when determining the right location for the NVR. Once you confirm that all components are working, proceed with installation. When choosing a location for your NVR, consider the required length of cable and how it will be routed from the cameras and the network router to the NVR. If you plan to connect a monitor to the NVR, take into consideration the location of the monitor and the route for the cable. The NVR is a sophisticated piece of equipment and must be treated as such. Place the NVR in a dry, clean and well-ventilated location. Refer to the operating temperature range of the NVR to ensure compliance. Do not place the NVR in areas such as an attic or unfinished basement where it may be exposed to extreme temperatures moisture, heavy dust or dirt. For businesses with an IT room or closet, this is the best place for the NVR. The NVR can tie into your existing cable and network infrastructure and can be rack mounted for a clean installation. Rack mount ears are available on avertx.com. AvertX recommends purchasing a surge protector to shield the NVR from power surges. Do not place the NVR near flammable or hazardous materials. The NVR does not require a monitor and mouse if it is connected to a local area network. The network connection will allow for remote operation via IE browser or the AvertX Go app for Apple or Android devices. Consult the User Manual for more information. For more information about placing your NVR, please see the DIY Guide Where Should I Place My NVR? Your system includes 100’ of Cat5e cable per camera, which is enough for most installations. If you need a longer cable to reach your camera installation location, you can use up to 300’ of Cat5e per camera. Distances greater than 300’ will require a Power Over Ethernet (PoE) switch or injector placed along the line that can be purchased at computer retailers like Newegg or Amazon. To protect against the elements and vandalism, the Cat5e camera cables should be routed through walls, crawl spaces, attics or conduit. The IP66 waterproof connector is outdoor rated. YouTube contains many excellent videos with instructions on running wires. When planning the cable route to the back of the NVR, make sure to include the extra length that is needed for placing cables in ceilings, walls, or under overhangs. Most installations require one cable run per camera plus one to the NVR from the Internet router for remote access (optional). You may want to consider hiring a licensed electrician to run Cat5e camera cables and mount cameras. Depending on your location and difficulty of installation, cost can range from $50 to $200 per cable run. Most electricians provide free estimates. If your installation is in a commercial building, consult local fire codes. Plenum rated cable may be required. Ideally, cameras should be placed around 10 feet off the ground to gain a wider view of the recording area. This also helps to protect against accidental damage and vandals. If the goal of your system is to capture license plates of moving cars, we suggest a specialty License Plate Recognition (LPR) camera and potentially a dedicated LPR system. AvertX cameras will be able to capture the license plate of a parked vehicle within 50 feet in daylight or in adequate ambient light at night. IR night vision will not be able to capture license plates because of the reflective surface of the license plate and lower nighttime camera resolution. To prolong the life of the camera, choose an outdoor location protected from the elements and out of direct sunlight. Under the eaves of a house or building overhang is an ideal location. Carefully plan the route for the Cat5e from the camera to the back of the NVR in advance. Depending on setup, it may be necessary to drill through walls, run cables through an attic or crawlspace, or to tuck cables under siding. Make sure you are prepared in advance and have the correct tools. Place cameras in locations that give you the greatest coverage of a recording area. For example, if placing a camera in a large square room, the camera should be mounted near a corner with the lens directed towards the center of the room. Avoid pointing cameras towards the sun, bright lights, or highly reflective surfaces. Cameras with Spectrum Vision True WDR are the best choice for locations with extreme light differences in the field of view, such as an indoor camera pointed at an exterior window or door. Spectrum Vision True WDR is able to compensate for situations with high contrast and will be more effective than cameras with digital WDR. The best way to identify people or objects at night is to use ambient lighting in the field of view, such as a porch light, streetlights or a motion activated security light. The camera will be able to record better quality video and if the ambient light is adequate, the video will be in color. IR night vision is black/white only and is the best alternative for areas where ambient lighting is not present. For best IR night vision performance, avoid pointing cameras at reflective surfaces or at objects that are very close to the camera. This will cause IR light to reflect back into the lens and severely limit night vision performance. For more information about what camera to choose, please see the DIY Guide Should I Use a Bullet or Dome Camera? The advantages of dome cameras are that they are aesthetically pleasing and it is difficult to determine the direction the camera is pointing. Choose dome cameras in locations where you can use these advantages. 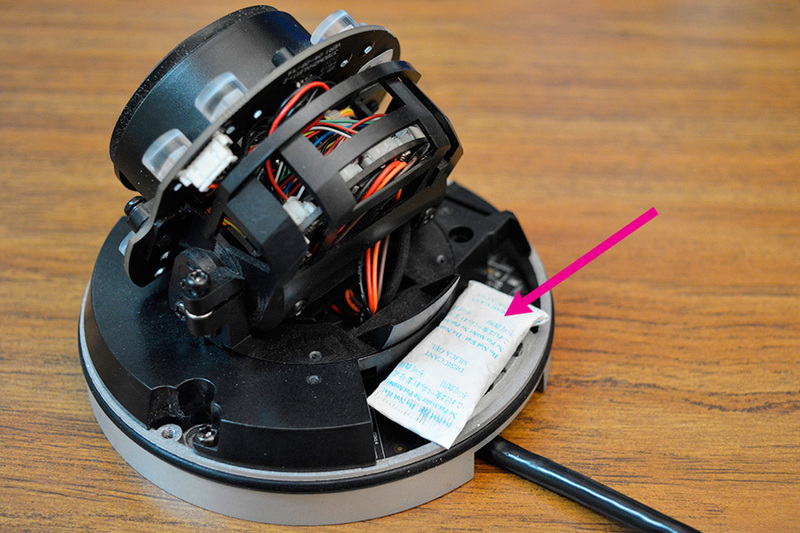 When mounting dome cameras, remove the dome cover before mounting. Leave the cover off, with the protective cellophane wrap on the dome until the camera direction is adjusted to your liking and the installation is complete. Reattaching the dome(s) should be the final step of dome camera installation. Insert the microSD card (sold separately) now if not installed during bench test. Skip this step if not using the microSD card back up feature. AvertX recommends inserting the included desiccant packet inside the dome cover for added protection from moisture. On most dome cameras, the packet can be tucked into the opening to the left of the microSD card slot (HD810 dome camera shown). Dessicant is installed in the HD820 dome camera at the factory. You do not need to add dessicant to this camera. To adjust tilt and rotation, loosen the set screw on the right side of the lens, adjust the camera to your desired position and carefully tighten set screw. When surface mounting the dome camera cables, ensure that the cable is not pinched between the base of the camera and the mounting surface by removing the cable notch on the base of the camera dome (HD810 dome camera shown). 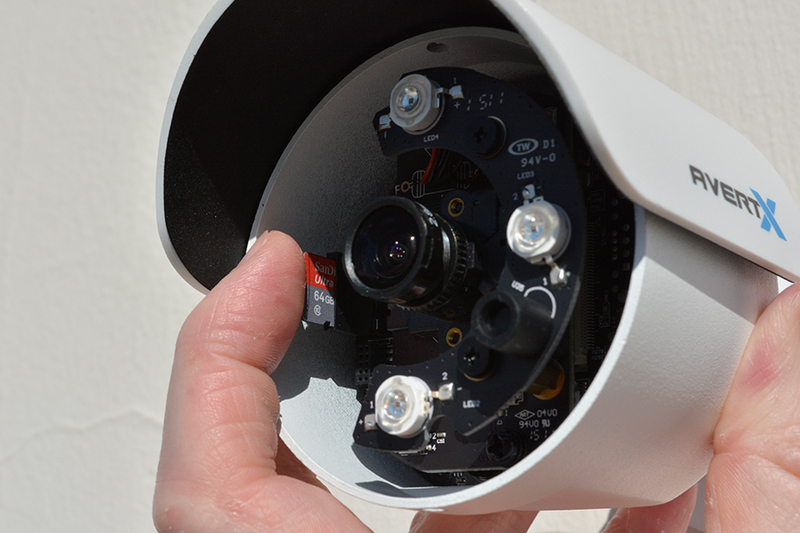 Mounting a dome camera directly to an unprotected, uneven or porous surface outdoors such as a stucco wall may allow water under the base of the camera and to seep through the seal. A bullet camera is recommended for this surface. Do not drill out or modify mounting holes in the base of the camera. Doing so can allow moisture to damage to the camera and will void your warranty. When reattaching the dome cover, ensure the cable notch on the dome cover is properly aligned to the cable before tightening screws. Tighten screws enough to ensure the dome is properly seated over base and firmly pressed against the rubber ring around the lens. If installing a dome camera in an outdoor location that isn’t protected by an overhang, seal around the base of the camera with silicone caulk. If you would like to mount dome cameras with a 2 axis adjustment lens on a vertical wall, the field of view will be restricted to perpendicular to the wall. If you would like to point the camera to see down the wall, it will be necessary to purchase a wall mount bracket. The key advantages of bullet cameras are that they are easy to install and the ball joint provides for maximum flexibility for positioning. 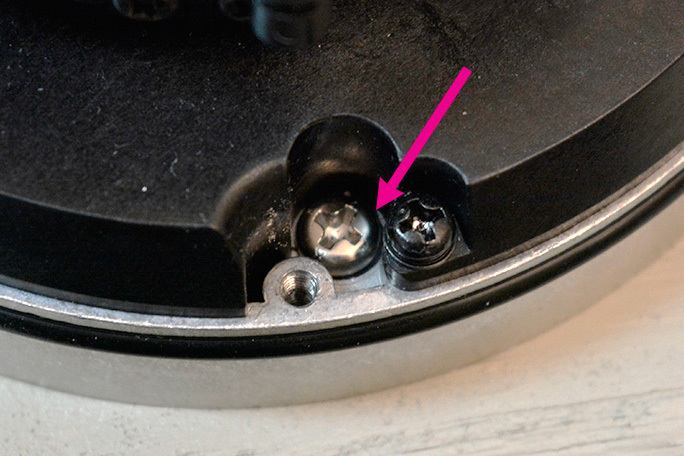 To mount a bullet camera, simply loosen the screw at the bottom of the ball joint and mount using the included screws. Take care to prevent the cable being pinched behind the mount. Point the camera to the desired position and tighten the screw. Use a PTZ camera in situations where you need to cover a large area, see at long distances, or would like the ability to zoom in on details. For maximum coverage, we recommend placing a PTZ camera at least 20 feet from the ground in a spot with uninterrupted line of sight. Your camera includes a shielded Cat5e cable with an IP66 connector to protect it from the elements. The connector must be attached correctly to ensure a strong weatherproof connection. Refer to included instruction card. When disconnecting the waterproof connection, the proper technique must be followed to avoid damage to the cable or dongle which may void your warranty. To disconnect, unthread the smaller base cap and slide down the cable, and then unthread the larger cap until the Cat5e connector is visible. Press the Cat5e connector notch with one hand and grip the threaded portion of the dongle with the other hand and pull away gently. 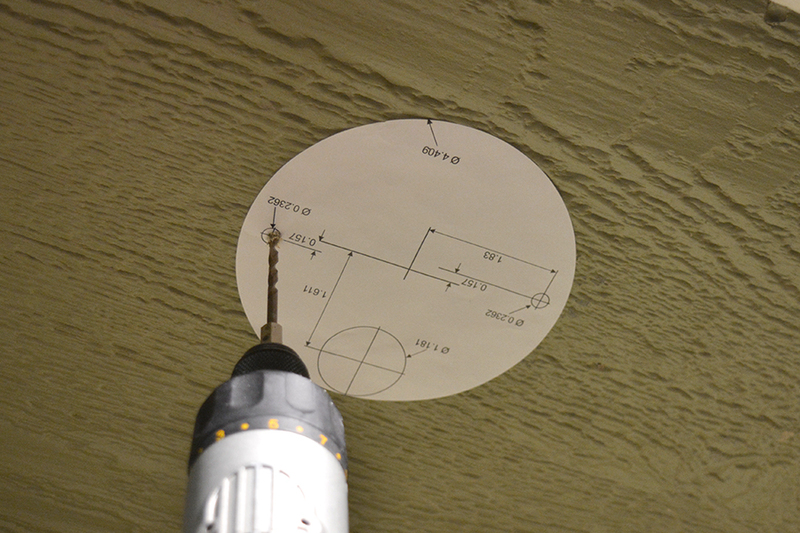 Use the provided mounting template or mark the screw hole locations with a pencil to drill pilot holes for mounting. Do not drill pilot holes through the base of the camera while holding it in place. Once all cameras are installed and connected to the NVR, power on the unit. Complete any remaining setup tasks as needed – set date/time, camera names, authorized users and passwords, etc. Refer to operating manual for more explanation. For maximum security, change the default admin password. Adjust cameras for the view you would like. Check view again at night and make final physical camera adjustments as required. Observe the motion detection alerts. Adjust the sensitivity settings and/or the detection areas to minimize the number of false motion events. Run with the default settings and observe for a few days. If desired, make camera adjustments through the NVR interface. More advance features are also available on the direct camera interface if needed. Verify that all cameras are recording to storage using the playback function. Check your storage capacity after a few days to ensure you are retaining the length of time that you would like. If you would like to extend your video retention, you can adjust system settings or add additional storage. Generally, most video systems are set at 15 fps to conserve storage. We recommend that this default setting is left at 15 fps unless there is a need to have 30 fps on a specific camera. Refer to NVR User Manual for more information on maximizing storage. For more information about maximizing the storage on your NVR, see the DIY Guide Maximizing Recording Time on Your Recorder. If you have any questions please email at support@avertx.com or call the AvertX PRO Team at 855-228-3789.